But with all of those “Flag Day” flags, I nearly let the day go without noting it. To that end, I turn to the Downtown Detroit Hudson’s department store of my youth. It was the a guaranteed visit for Mom and me. We went to every Thursday after getting parts at Westinghouse for my Dad’s business (at least before I was old enough for school). The Mickey Mouse Sundae with the meringue shell collar and the chocolate wafer cookies was a winner. The televisions in that store were where we learned that JFK had been shot. And Flag Day? Hudson’s had that covered. A day to salute the symbol of our national aspirations. 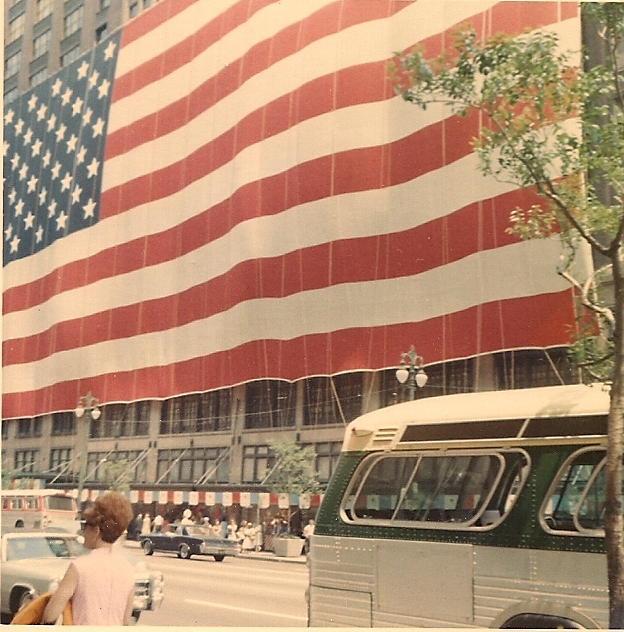 This entry was posted in Detroit, Flag, Hudson's, iPhone, JFK, meringue, Mickey Mouse, Scott Hanley, Treo, Westinghouse. Bookmark the permalink.